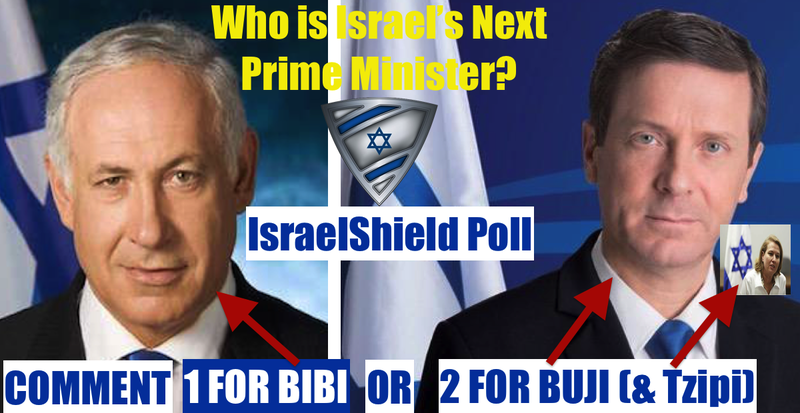 ISRAEL - JUST THE FACTS: The IsraelShield Poll Is Up! Who Would YOU Vote For? The IsraelShield Poll Is Up! Who Would YOU Vote For? Comment below 1 or 2 and let me know why. Do You Follow IsraelsShield online? Do You Support Israel? 1. I trust Bibi more not to give away the house. Buji is delusional if he thinks he can keep giving away more and more land to make the Palestinians happy. They won't be happy until Israel is under the sea. 1 - Bibi Netanyah. He is the man of the hour, the best man for Israel. OK, put in a 1 for Netanyahu. Every time Buji opens his mouth I say to myself "I GOTTA vote Likud!" Seriously, either Hertzog/Livni still haven't figured out that Obama is sonei-Israel -- in which case, G^d forbid we have people that stupid as our Prime Minister. Or they DO know it, but want to put our fate in his hands anyway -- in which case, G^d forbid we have people that wicked as our Prime Minister. "Zionist Camp" my fourth-point-of-contact! Obama doesn't speak for America, he is a traitor. America stands with Israel. Amen to that. With America not having a leader I'm glad that Israel has one, that will stand up for whats right. 1 Netanyahu is the leader whom we need! Any other vote is national suicide for Israel, G-d forbid!